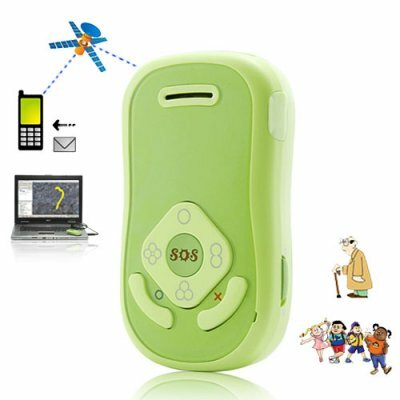 Successfully Added GPS Tracker Phone for Kids to your Shopping Cart. New tech gadget from Chinavasion: GPS Tracker Phone, a smart looking, back-to-basic cellphone designed for children and seniors, incorporated with the latest GPS tracking technology and extra ease of use. Anyone who needs reliable communication method and GPS tracking at the same time can benefit from this GPS Tracker Phone. Seniors citizens who normally have difficulty remembering long phone numbers can call any preset number with only 1 button press, Truck/Company car drivers with GPS tracking phones can send periodic location report back to their management as well as communicating using the tracker. Tourist can also take advantage of its small size while enjoy the benefit of knowing exactly where they are. What is the difference between GPS tracker phone and a GPS tracker? Normal GPS tracker are designed for tracking purposes only, some of them have the two-way calling function but hard to use because of its design, where as the GPS Tracker Phone is a mini cellphone. You will find the sound quality of its mic and speaker are much better, as well as an included earphone for more convenience. The GPS Tracker Phone doesn't work. What's wrong? The return TXT message from the tracker contains a lot of numbers and does not make any sense to me, what should I do? On the manual CD, there is a file called "Tracker Specification.pdf", the format of different return TXT messages are specified within that file, so please read carefully. How do I make the GPS Tracker Phone send reply TXT message to my own cellphone number? Using the manager tool supplied with the CD, sync your tracker phone with the software first, then enable "GPS Setting and Main Server Register". Choose "Force on SMS", then input the cellphone number that you wish the message to be sent to in the "Main SMS Gateway" text box. How does a GPS tracker actually function? There's a sophisticated GPS microchip embedded into the heart of this tracker which continually reads its own location from low orbiting global satellites and then utilizes the GSM infrastructure operated by major cellular network providers via the SIM card to transmit its current location to you. I'm a mom and I'm trying to figure out how I can put this product to use. OK, picture this. You drop off your teenage kids at the library, but you can't be sure whether their there studying after you dropped them off, or off to a friends house for some tomfoolery. Just hide this in their knapsack and send a text message to the SIM card within the GPS tracker & the location in precise latitude & latitude will be sent to you automatically from the GPS tracker. Then you can then check their location using Google maps and see if your kids are really at the library or...at. The. Mall. on 2011-04-11 00:50:50 Perfect product. Sagested to all parents. Perfect product. Suggest to all parents. Before to use, read the manual carefully.